Secluded & private; Tucked away at the end of a gated drive. Stream-fed Koi pond w/two creeks on 4+ acres! 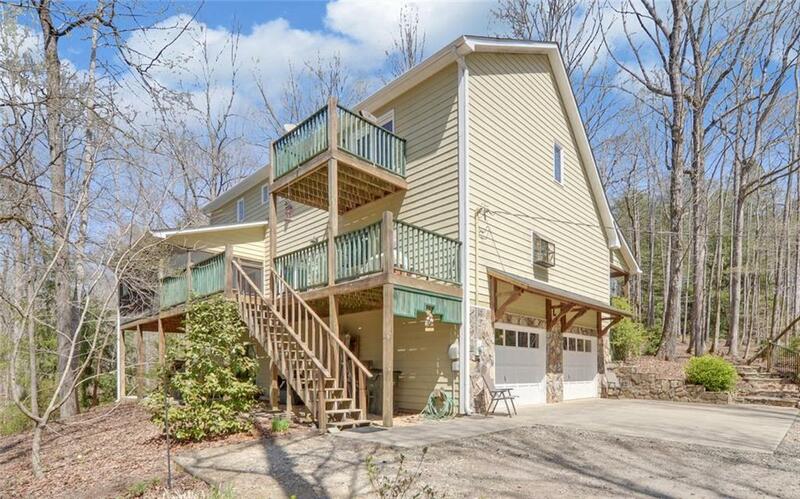 Spacious kitchen w/custom cabinets, dining area w/french doors that lead to screened porch. Great room with vaults, sky lights, built-ins & wood burning stove! Master bedroom with walk-in closets & built in entertainment center. Hardwood floors throughout most of main floor. Master bath w/double vanities, huge walk in tiled shower. Full finished terrace level w/additional bath. Covered rocking chair front porch. New roof!! 16'x32' out building for your toys! Directions: From Ga400, Going North; Follow To The End; Right On Hwy 60; Left On Pony Lake Rd. Right On Gold Ridge Rd. House On Left.